How Dare Malia Obama Be a #CarefreeBlackGirl and Miss Hillary Clinton at the DNC?! 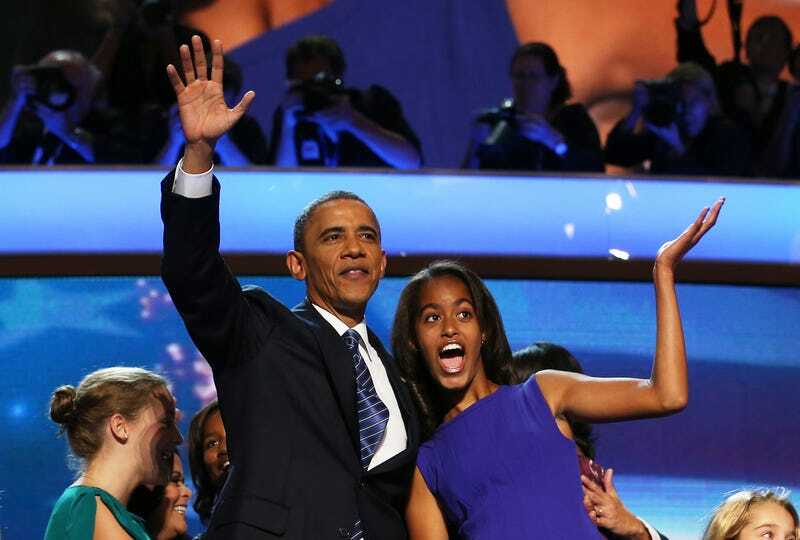 President Barack Obama waves onstage with Malia Obama during the final day of the Democratic National Convention at Time Warner Cable Arena in Charlotte, N.C., on Sept. 6, 2012. Hillary Clinton gave a personal (read: boring) speech at the Democratic National Convention that left the crowd roaring. But Malia Obama wasn't there! How dare she? Who does the oldest daughter of President Barack Obama and first lady Michelle Obama think she is?! This is just a thought, but maybe Malia Obama is just a #CarefreeBlackGirl who likes music. The New York Post's gossip rag, Page Six (the same publication that scored the coveted interview with resident bamma, Ed Hartwell), reported that instead of attending the DNC and watching Clinton's speech, Malia decided to head to Chicago for Lollapalooza. Let the whole world gasp! The Post is reporting Malia's attendance at the concert as if she were "skipping out" on Hillary. Did Chelsea Clinton attend the DNC when Barack Obama was a candidate? Was that Page Six news? The 18-year-old first daughter was spotted by concertgoers who couldn't ignore the Secret Service blocking their view of Cashmere Cat's set. Malia is obviously a fan of music. She went to Lollapalooza in 2014 to see Chance the Rapper, and there was also that time the world lost its collective mind when she wore a Pro Era T-shirt. (Note: Pro Era is a Brooklyn, N.Y., hip-hop collective.) And Malia is also a teenager, doing teenager things, to the best of her heavily protected ability. So she went to a concert instead of the DNC. No big deal, right? I did my research (read: spent three minutes Googling), and I found nothing that stated that the children of the outgoing president have to attend the DNC—or, honestly, anything they don't want to go to. I could see if Malia skipped Michelle Obama's stellar speech and was spotted drinking tequila shots at the club, but that's not what happened. I'm sure it's tough enough growing up the child of a president, especially when you come of age while the world is watching and the Secret Service is over your shoulder. The Obama family only has a few more months to be all presidential and whatnot. Can't Malia just enjoy her youth? Check out Malia at Lollapalooza!